Victory Belt Publishing, 9781628603477, 384pp. 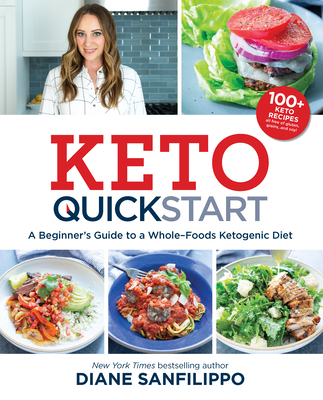 New York Times bestselling author and health and wellness pioneer Diane Sanfilippo brings her own experience with a ketogenic diet to Keto Quick Start, a comprehensive and easy-to-follow road map to transitioning to a keto lifestyle. There’s a good reason keto has attracted so many followers: it’s an effective tool for fat loss as well as a way of eating with proven benefits for many health concerns, including unstable blood sugar, neurological conditions, and epilepsy, to name a few. But getting started with keto and sticking with it can be tough. That’s where Keto Quick Start comes in. In her signature practical style, Diane makes keto doable for everyone, whether you’re completely new to very low carb eating or you’ve tried it before and want to find a better way to make it work for you. Keeping the focus on real foods that nourish your body, she walks you through a gentle transition to keto and helps you figure out how to make it sustainable for the long term. Keto Quick Start targets everyday real-world concerns such as what to expect in the first few weeks and how to know if you’re on the right track, how to determine if you need more carbs and how to incorporate those carbs in a healthy way, how to customize keto for your personal goals (especially weight loss), and things to be aware of if you’re concerned about a particular health issue. Diane Sanfilippo is the owner and founder of Balanced Bites, a certified nutrition consultant, the New York Times best-selling author of Practical Paleo and The 21-Day Sugar Detox, and the coauthor of Mediterranean Paleo Cooking. Her most recent book is The 21-Day Sugar Detox Daily Guide. Diane holds a BS from Syracuse University and is certified in holistic nutrition, holistic lifestyle coaching, and Poliquin BioSignature Modulation. She is the cocreator of the Balanced Bites Master Class and the cohost of the top-rated weekly health podcast The Balanced Bites Podcast. In 2016, Diane released an updated and expanded second edition of her runaway hit Practical Paleo, which has sold over half a million copies and spent ninety-seven weeks on the New York Times best-seller list.